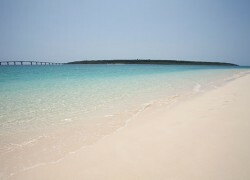 This is the beach that has made Miyako Island a popular destination. With its seven-kilometer-long stretch of super fine white sand, Yonaha Maehama Beach is amazingly beautiful and has been called the best white sand beach in East Asia. Rarely crowded, the beach is an ideal destination for people looking to just relax and unwind.